If you enjoy spinach and other fresh garden greens, but wish you could extend the harvesting season without replanting, red stemmed Malabar spinach (Basella alba) may be for you. This amazing spinach-like plant produces an abundance of fresh greens on trailing vines that can be harvested all summer. In fact, unlike regular spinach (Spinacia oleracea) that bolts in the hot weather, Malabar spinach actually performs best when the mercury soars. That means fresh spinach all summer long. Although Malabar spinach isn't actually a true spinach, its flavor resembles spinach and it can be cooked and eaten in the same way, making it an excellent solution for growing fresh spinach in the summer garden. Soil: Malabar spinach prefers moist, fertile soil with a pH between 6.5 and 6.8, but tolerates most garden soils. Allowing the soil to dry excessively promotes blooming, which in turn causes the leaves to become bitter. Keeping the soil moist improves the flavor of the delicate leaves. 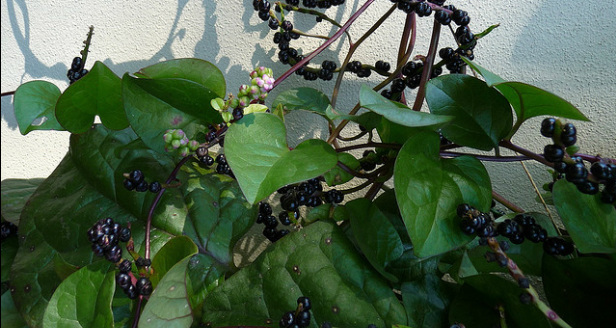 Lighting: Malabar spinach prefers full sun for six to eight hours a day, but will grow in a partially sunny location. According to Cornell University, it produces larger leaves when grown in less light, but overall growth may be inhibited. Planting: Start Malabar spinach inside 6 weeks before the last expected frost in your area or direct sow in the garden when the soil has reached 65 degrees F. Seedlings emerge in 14 to 21 days. Nicking the seeds with a fingernail file and soaking them overnight before planting helps to speed germination. Trellising: Malabar spinach climbs by twining around stakes or trellises. It may require some assistance by guiding the vines to the trellises, but soon begins to climb on its own. Malabar spinach is well suited for poles or teepee trellises. Water: Water Malabar spinach once or twice a week, or whenever the soil feels dry to the touch one inch below the surface. Harvesting: Harvest leaves as soon as they are big enough to use in fresh salads or cook as spinach.